The honeymoon is over! We’re officially past the NFL openers, and now it’s time to share some of my favorite value picks for Week 2 on FanDuel for wide receiver, running back, quarterback, tight end, kicker and team defense. 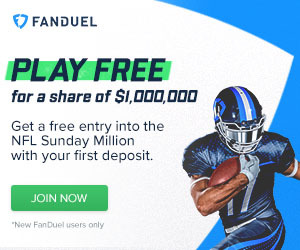 As a columnist over at FanDuel (read value QBs), I’ve been able to take a deeper look at their game from a strategy perspective, and that has allowed me to view their players and salaries in a different way. Add to that the Fantasy Knuckleheads FanDuel Optimal Lineup Tool and now we’re well ahead of the game! After posting our Week 2 Fantasy Rankings, and going through the FanDuel salaries, I came up with a couple of my favorite value plays at each position for the upcoming weekend of NFL action! My goal is to find a decent high-priced player that will give you a good return on investment, and a cheaper value play that will allow you to spend more money at other positions. Drew Brees, New Orleans vs. Tampa Bay: The future NFL Hall-of-Famer doesn’t have Jimmy Graham anymore, but he does still have plenty of passing weapons, including Brandin Cooks and C.J. Spiller (knee), if he plays. Last week, Brees threw 48 passes – just four fewer than Week 1 leader Sam Bradford. The Saints should attack the Bucs through the air again, especially after seeing rookie Marcus Mariota tear them apart with four touchdown passes in the first half Sunday. Tyrod Taylor, Buffalo ($6,300) vs. New England: The fine folks that set the salaries over at FanDuel had to set Taylor’s Week 2 salary before Week 1 was over. They increased it from the preseason $5,000 Week 1 salary, but it wasn’t so much that it ruined this athletic quarterback’s value. The Pats defense isn’t as good as we thought, and Taylor has playmaking weapons all around him, including his feet. Lamar Miller, Miami ($7,300) at Jacksonville: The Dolphins gave Miller just 14 touches in Sunday’s game against the Redskins, but the Redskins controlled the clock for most of the game. He’s a bargain at this price, with 12 running backs costing more this week. Danny Woodhead, San Diego ($6,200) at Cincinnati: Surprisingly, there are 34 running backs with higher Week 2 salaries this week, but they had to set salaries before seeing Woodhead get all six of the team’s goal-line touches in Week 1. The Bengals are better than they played against the run last week, but they did allow 16 rushing touchdowns last season. Jordan Matthews, Philadelphia ($7,000) vs. Dallas: After catching 10 balls on 13 passes for 102 yards against the Falcons Monday night, Matthews is a supreme bargain against the Cowboys, who allowed the fifth-most receptions in the NFL last year. Brandon Coleman, New Orleans ($5,000) vs. Tampa Bay: We’ve already mentioned how screwed up the Bucs’ secondary and pass defense is, and now they get the 6-foot-6 rookie, who caught two touchdown passes last week. Zach Ertz, Philadelphia ($5,200) vs. Dallas: Ertz entered Week 1 questionable, so his salary didn’t rise much despite getting thrown to eight times Monday against the Falcons. Austin Seferian-Jenkins, Tampa Bay ($4,500) at New Orleans: We saw last week how much rookie quarterback Jameis Winston went to his sophomore tight end, and that should continue in Week 2, if this game gets out of hand again. Dan Bailey, Dallas ($5,000) at Philadelphia: I like to pick kickers on teams with offenses that rack up first downs, which means they don’t do a lot of long touchdowns and they can march up and down the field. The only team with more first downs last week than the Cowboys is San Diego. Graham Gano, Carolina ($4,600) vs. Houston: Kicking in a dome is a good thing, and the Panthers don’t appear to be clicking yet on all offensive cylinders. I can see them moving the ball, but not scoring a lot. Miami Dolphins Defense ($5,100) at Jacksonville: This one could get ugly, as Vegas has the Dolphins installed as six-point favorites in a game they expect to total about 41.5 points. That puts the Jaguars scoring between 17 and 18 points, but we’re leaning toward even less. Carolina Panthers Defense ($4,700) vs. Houston: The Panthers defense plays at home this week, and they’ll be going up against QB Ryan Mallett, who didn’t win the job out of camp. As a matter of fact, the Panthers will be facing the backup quarterback and the backup running back (Alfred Blue). 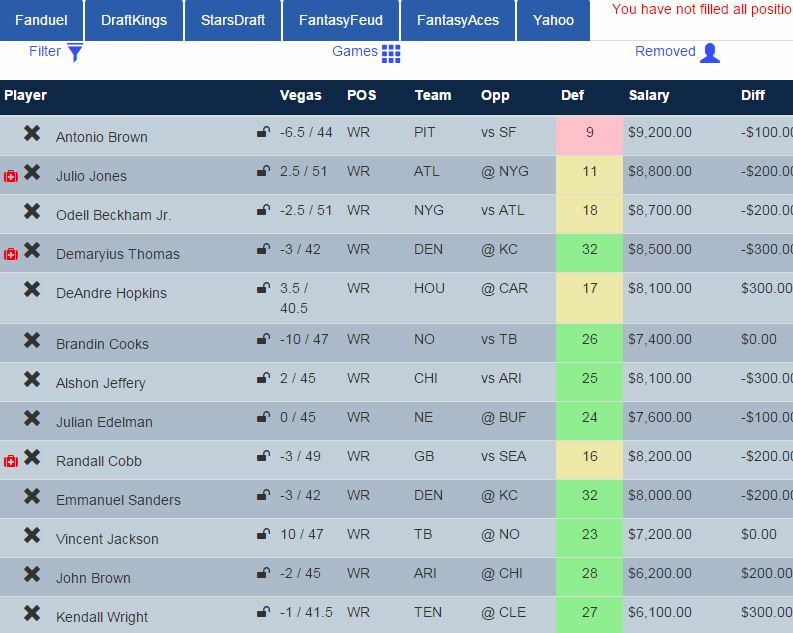 Good luck in Week 2, and make sure you run your prospective FanDuel lineups through the Fantasy KnuckleHeads optimal lineup tool for Fanduel. We had Julio nailed last week. Here's our top WR for Week 2 unearthed with our DFS Tool.